By This year could see the biggest “dead zone” since records began form in the waters of the Gulf of Mexico. Scientists say conditions are right for the zone to exceed last summer’s 6,662 sq miles (17,255 sq km). The dead zone is an area of water virtually devoid of oxygen which cannot support marine life. It is caused by nutrients such as fertilisers flowing into the Gulf, stimulating the growth of algae which absorbs the available oxygen. The volume of nutrients flowing down rivers such as the Mississippi into the Gulf has tripled over the last 50 years. The annual event has been blamed for shark attacks along the Gulf coast, as sharks, along with other highly mobile species, flee the inhospitable waters. Animals which cannot move simply die. "I am anticipating a historically large hypoxic (oxygen-deficient) zone this summer, because the nitrate loading this May, a critical month influencing the size of the area, was very high," said Eugene Turner from Louisiana State University. "The relatively high nitrate loading may be due to more intensive farming of more land, including crops used for biofuels, unique weather patterns, or changing farming practices." The nitrate load is so high that the dead zone may attain a size of 8,500 sq miles (22,015 sq km), almost double the average since 1990. However, an active storm season could change that forecast, as storms mix the seas, dispersing nutrients and algae and bringing in oxygenated water. Professor Turner is one of the scientists involved in modelling the dead zone, supported by the US National Oceanographic and Atmospheric Administration (Noaa). The United Nations warns that dead zones are becoming more common globally as intensive agriculture spreads. Its 2003 Global Environment Outlook said that the number of seasonal hypoxic areas has doubled each decade since the 1960s. 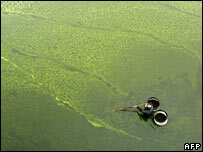 The UN believes the algal blooms are having a significant impact on commercially valuable fish stocks.